Veteran Los Angeles lawyer/songwriter/producer/manager/impresario Buck Ram discovered The Platters in 1954. The group had formed in 1953 and recorded for the Federal record label but they were having no real commercial success. Legend has it that Ram discovered the four members working as parking lot attendants and signed them immediately. Buck Ram came up through the big band scene, working with Duke Ellington, the Dorsey Brothers and Count Basie. He began to develop a stable of artists in the early fifties that included singing groups like The Penguins, The Flairs, The Colts, The Teen Queens and many others. Initially, he used the groups to make demonstrations of his own compositions but after signing The Platters to Mercury Records, they scored a number one R&B hit with Only You. This song was written by Ram, as were most of the hits The Platters had during their career. Before long they were performing concerts, appearing on TV and singing in major nightclubs all over the world. The next record they released, another Buck Ram composition called The Great Pretender, went to number one across the U.S. and on the European charts. Decades later that gold record remains one of the classics of modern popular music. Throughout the late fifties The Platters remained one of the premier teams in pop music consistently releasing records into the top ten and hitting the number one spot many times. Hits like The Magic Touch, It Isn't Right, My Prayer, Twighlight Time, Smoke Gets In Your Eyes, Ebb Tide, I'm Sorry, Harbor Lights and Enchanted, mostly written by Buck Ram, helped define that era of rock and roll. The sixties brought a decline in chart activity for The Platters and they were virtually off the charts from 1961 to 1966. During this time there were wholesale personnel changes as members left the group and were replaced. This led to various groups emerging and calling themselves The Platters. Numerous lawsuits took place over unauthorized use of the name. 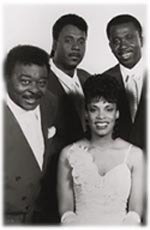 Buck Ram formed a group that relied on his experience as the guiding light behind The Platters career. Ram continued to tour the group and Bernard Purdie was a member for many years. In 1985 Purdie decided to cut back on touring and after a brief hiatus formed his Salute to the Platters, giving him artistic and managerial control of his great tribute to an era in pop music. Lead vocalist Bernard Purdie was a member of the Virginia based harmony recording group The Avalons for many years. The group toured throughout the eastern and southern United States and released a number of regional hit records. His powerful voice brought him to the attention of Platters manager Buck Ram and he left The Avalons to take a spot with The Platters under the management of Ram when the group was undergoing a personnel change. 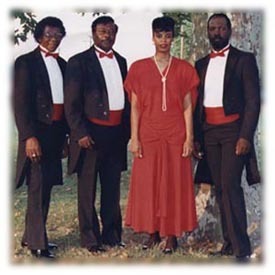 In the mid eighties Purdie formed the Virginia based Salute To The Platters which has become so very successful in the United States and parts of Canada. From home bases in Lakewood, Florida and Boston, Massachusetts, showstopper Billy Lee Hughes, also known as 'Hollywood', has made his mark singing with groups throughout the United States. The man with the golden voice brings a natural ability to warm the hearts of sold out audiences from one end of the country to the other and in that great Tony William's tradition, makes him the perfect frontman for Bernard Purdie's Salute To The Platters. New York City based Laurie Anderson came to the attention of Bernard Purdie when he was searching for a dynanic female singer. Her work as a lead vocalist with Gary U.S. Bonds and her radio work in New York with numerous groups who had worked with various Platter's tours made her a natural choice for a spot with the Salute To The Platters. Hailing from Norfolk, Virginia, this longtime member of The Avalons has the silky smooth vocal stylings that are such an important element to this authentic tribute to one of the most memorable groups in popular recorded music. An evening hearing and watching "Mr. Smooth" is an evening to remember.